For almost two months my blog could not publish into the cyberworld. It has somehow stop publishing after my attempts in renewing my blog with blogger went kaput. The difficulty in accessing help from blogger also exacerbated my problem. So, after worrying so much about it, I have decided to just get back to being blogspot while trying to figure out how to get back to my custom domain. So, here I am publishing in blogspot. Without my blog, I missed a lot of things to say. I missed talking about Megan Young’s Miss World 2013 coronation. I missed yakking about the US government shutdown that had me wondering how come the super powerful country has got into such situation (has common sense gone unknown?). I missed saying my piece about the Zamboanga siege (selfishness and greed were big contributors to such unfortunate situation). I just missed talking about whatever considering my blog always helped me in putting my thoughts together. Never thought that I could miss blogging until I lost my blog temporarily. The problem started when I started renewing my domain blog with blogger by paying thru credit card. When the inability to pay thru credit card started a few weeks prior expiration date, I was traveling abroad. Whenever time and connection allowed, I checked on my blog and the thought that I would be having problems with the renewal never occurred to me considering that it has been an annual activity for some years ago. Compliance is the culprit. Well, I still have other blogs that I need to get back to but sentimental value sometimes could get a better hold considering what I missed was my first and only custom domain. Praying that I could get it back soon enough. With many family members taking to Facebook these days, it can be easy to avoid making an effort with them offline too. Birthday greetings can be sent in a matter of seconds, and you don’t even need to speak to them about their latest holiday as you can simply look at the photo album they publish. There is something both simple and wonderful about having a proper (verbal) conversation with someone, so I’d suggest getting yourself off the computer and putting yourself back in front of your family members to really get to know them. The first place many people will start is to organise a family reunion. Depending on how large your family is, you could either have this at someone’s house or garden, or even hire the local community centre for the evening. Logistically, you’ll want to choose a day or evening that most people are likely to be free on - Saturday is often the top choice so people can recover the next day if they have a few too many glasses of wine. Give people enough notice of the reunion date, especially if they are travelling from further afield. If you call a member of your family and they are genuinely shocked to hear from you, there is a good chance that they think that you don’t ring them enough. Of course, it is a two way street so they could have made the first move too. However some people are unable to afford expensive phone bills so if you can then it only makes sense for you to call them; try and make it a regular event. We now have a family piggy bank where we all try to put in a few pounds every week so we can enjoy celebrations and days out together. Usually I’ll take a small portion of my salary but other times I’ve been able to put in a bit more, like when I sold some DVDs online. This year we’re having a big family Christmas so our savings will be going towards food, decorations and wine. Finally, why not get your family together and have a lovely summer holiday abroad? We’re planning to do this next year as we’ve found a beautiful villa in France that has lots of bedrooms and even a swimming pool. We’ll be able to enjoy barbecues on the terrace, and there will be plenty of opportunities to take some photographs for future generations to look at. The 2013 Kadayawan Festival Is On! After some nailbiting days agonizing if it is really wise to continue with the 2013 Kadayawan celebration, Mayor Rodrigo Duterte finally gave the go signal. The crowd went silent when he did the speech. For some (like me and most photographer-hobbyists), we listened as we held our breath. For sure the threat was and still is real just even for the mere fact that the security during the Panagtagbo (Kadayawan opening ceremonies) was really tight. But like a worried father relenting to his offspring’s wishes he said yes but with added strict precautions and security personnel protecting the city and its constituents. Several days into the celebration, military presence is already everywhere. The people feel safer, for sure. And with God’s graces, the Kadayawan celebration this year is going to be one successful one as what were then the past years. August has a lot of holidays that me and my photographer-friends are planning to do some landscape photoshoots. Am all for it even if the early wake-up calls are killing me. They are the least of my worries, actually. What I am worrying about most are two things. One is that my tripod which is relatively new seems not sturdy enough to stand against the rocks, waves and what-have-yous that we are going to encounter in some coastal shoots. The first time it was tested, it stood well but standing beside the tripods of my friends, it looked malnourished. It may have been wrong for me to assume when I bought it that I would just be using it in sturdy ground without waves and rocks and such. As our landscape photography-teacher said, a sturdy and reliable tripod is a basic necessity if you want to shoot really good landscape photographs. The other one, I thought I did not the filters. Mind changed. In an instant. After seeing their fantastic use during our landscape photography class. But this girl is running out of the budget already..oh what to do! Tic tac..tic tac..I might need another income to finance my getting-to-be-more-expensive hobby sooner than I think. The traveling bug was caught from my father and he was the one that encouraged us all to go outside our world, explore what is out there and get some adventures. He worked as a professional driver and he was the first one to go and work overseas in several countries. Whenever he returned, he had a lot of travel stories to tell. The ones that stayed with me were the ones he had during the first Gulf War. He drove trucks and trailers for hundred of miles, met a lot of people like the Stevens Transport and learned a lot about life because of these travels. For him, his job was a big part of his life and this was why he appreciates meeting people like Stevens Transport. For him, to do his job well was not only to do his job conscientiously but also to improve himself through learning from the people he met in his travels. On the other hand, traveling beckons to me again this year. It always does. This is why I try to travel whenever time and money allow. With still more than a month of waiting, travel plans are being finalized. Actually, all that is to be done is to finalize our hotel bookings and we are all good to go. A friend is still having second thoughts but with or without her, the travel itinerary is already laid out. We are also having talks for our next year travels. Initially, my friends and me are going on an international tour. The trip could take about almost a month to complete. Another planned trip is going to be a local tour that might last for a day or two preferably, just for a weekend. For next year’s travels, initial researches are already being done. Several options such as www.stevenstransport.com are being considered. Of course, money is a big consideration for all but it does not hurt to dream and to look forward to something other than just work the daily grind without going somewhere. Finally, after a very long wait and a lot of pulling strings, our budget for the laptop replacement has finally been approved. With the approved budget, we are now tasked to find a suitable replacement and since no one in our division has the expertise to do such thing, the tasked was given to me in default. Beyond all question, one of the most elegant and noble watches does include the Rolex Cellini whose creation pays homage to a sculptor and goldsmith during The Renaissance, Benvenuto Cellini. The traditional horological technology is perfectly combined with the rigorous craftsmanship, making each and every Swiss Rolex Cellini watch not only great-looking but also highly dependable. This luxury watch considered as a romantic and charming accessory is one of the most ideal gifts to your favorite person. What you should do is to make up your mind to buy a Rolex Cellini watch to the one you love. There is no denying that all kinds of Rolex Cellini watches are worth collecting. On the one hand, they are impressive works of art; therefore, people who never stop the pursuit of art should purchase those luxuries at once. On the other hand, the value of luxurious products will increase. Consequently, forward-looking consumers generally choose to invest money in purchasing Rolex watches such as Cellini watch. For you, buying a Swiss Rolex Cellini watch on sale is of significance. For one thing, it enables you to take on a better look, which could add your charm and upgrade self confidence. For another, that you wear a fantastic Rolex watch can for a certainty demonstrates individual wonderful taste and it will make you more different in the crowd. The above two aspects indicate that you need to shop for a glamorous Rolex Cellini. 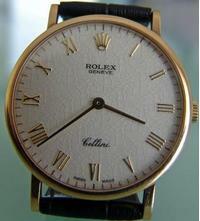 Rolex cellini replica is recommended. It’s true that replica designer watches have already been in hot demand in today’s world and the main reason consists in their affordable prices. You should instantly seek out the replica Rolex Cellini watch online and decisively spend money in getting it; the sooner the better. A Facebook post last Sunday stopped me from what I was doing. It said about Glee's Cory Monteith's untimely death. He was found in a hotel room. The first thought for me was, "What a pity! What a waste!". He was such a handsome and talented guy. Musicals never fail to amaze me. Amazed how those talented people could actually sing and dance at the same time. Musicals on TV can be strange for me though because probably, I got used to seeing them in movies and mostly, the present TV musicals could get long winding and then it becomes boring. However, when I saw Glee it was interesting and fast moving which is why the news of Cory Monteith's death for me was saddening. My prayers for his soul and his family. That is what I have been telling myself since I have started playing Candy Crush Saga last two weeks ago on my Samsung tablet. Some friends are crazy over it. Crazy enough to buy additional lives. and crazy enough to buy bigger sized tablets instead of the small ones. I have been hearing the game usually downloaded on the androids a few months ago but for one who is not into computer games, it was just nothing. But curiosity kicked in so the Candy Crush app was used with the thought that the game will be played sparingly. Wrong. It has stopped me from blogging and has fringed on my reading time. Sometimes, I feel stupid playing it but it can really addicting. The concession is I only play it up to its 5 lives limit. Anyway, the promise is to stay disciplined and just play up to its limit. And, the blogging should be restarted too. Finally, we are branching out. After a lot of false starts, the people behind it are getting serious. We are opening two more branches initially and could add two more next year. For the sake of our loyal clients, am praying that the plans will push through notwithstanding the opposition from some employees. The farther branch to be opened was supposed to be the first one to get occupied but the building owner was late in the installation of its final facilities. The next branch which is nearer from our current location is going to be opened next month. Floorings are almost done, glass installations are scheduled to be installed this week. Next week, carpets for the officers'offices are to be installed. Tigressa carpets were considered for their attractive colors and for their good worksmanship but nothing has been confirmed yet as all purchases for the new branches are subject to our Head Office's approval. The officers are given the chance to choose their office's furnishings as long as it is within the allowed budget. If I shall be given the chance to choose my office's furnishings, I would probably go for the wood floorings and the private quarters furnished with the Tigressa carpets. The coming weeks are promising to be challenging. Already, the pressure at work is getting more intense day by day. We are gearing towards faster services but I am not sure if we are better prepared for it. Assurances were made but apprehensions are still prevalent. Prayers are in order but nothing is sure. Personally, I only hope for the best. Retirement is still too early for me but it is now starting to knock on my door. God has plans, I hope I shall have the strength and wisdom to accept them. A work-in-progress, traveler, adventurer, lifetime learner, booklover, movie addict, proud to be Filipino, perennially curious, gym habitue and sports enthusiast.